Clearly, students are plugged into their phones, but what are they looking at and how can we make them see our information? Have young adults moved away from Facebook? It seems as soon as one social media platform is mastered, the game shifts and a new strategy is required. In this episode of the College Marketing Podcast, we talk to Brandy Beucler about the shift in how college students are using social media. 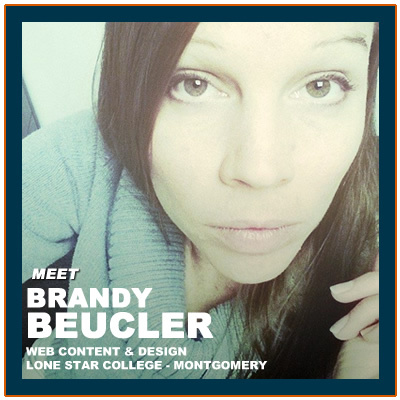 Brandy is the web and design coordinator at Lone Star College – Montgomery in Conroe, Texas. Brandy shares with us the findings from Lone Star College’s student surveys and focus groups about social media usage. We also discuss ideas on how to enlist social media administrators to capture up to date messaging on Twitter and Instagram. If you have ever struggled reaching your student population in a meaningful way through social media, then this is the episode for you. Tell us a little bit about your role at Lone Star and what you do there. Beucler: Okay. I’ve been here for about 6 years now and I started out as a web coordinator and slowly but surely I started getting all these other digital marketing tasks so I’ve become the digital marketer so I’ve got social media and digital signage under me now. Just anything anybody has, I’ve got a kiosk and presentations and things like that. I love it, it’s always changing, it’s always fun. Medford: Yeah, that’s great. Lone Star is like a six-campus system, is that right? Beucler: Yeah, we have six different main campuses and we also have one in Jakarta, which is sort of fairly new, but for the most part, other than that, we are in the north Houston area and we have several other satellite campuses as well. Medford: Your main role is really focused on the Montgomery campus or do you work for all of them? Beucler: Main purpose or functions are at the Montgomery campus and we really do coordinate together, which is nice because we have like several different co-workers or people that are kind of in our same field that we can collaborate with, which is nice. We both were at the NCMPR conference in St. Louis last week. What’d you think of this year’s conference? Beucler: I thought it was really great. I really like NCMPR because you make so many good friends, so many networking opportunities. I’m in the nearest path of contacted people and said, oh hey, can I pick your brain about this? The networking is awesome and I really like the breakout sessions and the round tables and stuff. You learn so much about our target audience, which is really nice. There are some presidents and administrators that listen to this show. What would you tell them, why should they make an effort to send people to NCMPR? Beucler: Like I said, it’s targeted to our people, so not only do we learn about social media or the web or different marketing techniques, but it’s targeted to our own situation. How do you get faculty involved? How do you get students really engaged? It’s not just a general marketing conference. I think it’s really targeted and it helps like me, specifically. Like I said, I’ve been able to network with people in my same professional field, kind of pick their brains out. I think it’s really worthwhile. Medford: Yeah. Even though it’s a communications conference, what I’ve found that was interesting, I think at a lot of community colleges, people think about themselves in silos, you know, it’s like, don’t go messing over there with the foundation. There’s all this silo effect there, but I really felt that this conference, it really, there’s a lot of talk about strategies and really bringing different groups together within the community college in working with marketing in a collaborative, which I thought was really positive. Beucler: Yeah, I really see that, too. You gave a breakout session this year called, “A Shift in How College Students Use Social Media.” Was this your first time presenting at NCMPR? Beucler: Yeah, it was my first time presenting at NCMPR. I’ve taught classes before, so I told myself, you know, it’s no different than just being in a classroom, but what I thought was really cool, it wasn’t just me teaching everyone, it was like, I asked the audience, how many of you guys are doing social media? Pretty much the whole room raised their hands and I was like, great, this is like a collaboration thing. We really broke it down in that session is like we’re all professionals that share our experiences and what works and doesn’t work, which is kind of risky, but it went really well and I think a lot of the people in the audience were able to break off the things that they thought were correct but weren’t, you know, misnomers, and we all sort of learned together. It was really neat. Medford: That’s awesome, so you did just as much learning as you did teaching, really. Beucler: Right because we’re all professionals in this area, so I thought, we can all, since it’s so new too, we can really bring a lot of our own experiences into it, so that’s cool. One thing that really stood in my mind is as soon as one social media is mastered, the game shifts and a new strategy is required. That is so true. It is true. We have the ability, I mean, in our field, it’s awesome. It’s always challenging, it’s always creative. We get an opportunity to show the real story of the authentic and it’s not just typical marketing, it’s fun. It makes marketing fun, but that is the one downfall is that it’s sort of changing and shifting. I think it’s just with our young audience, they always want to be sort of mysterious, you know? Always, you don’t know what I’m going. Anyway, it’s great. I love the environment, it’s sort of always changing, but it does, it makes it challenging. One of the things you talked about is, has Facebook lost its iron grip on social media? Right. Whenever I first started is the campus, everybody’s college has a strategic plan where they say, okay, these are goals, this is what we’re looking forward to doing and we want to put that on you guys to accomplish them. They put it on us or me to really look at social media and try to better communicate with our students, so that was kind of on my radar last year. You hear all the buzz words about oh, Facebook is kind of for the 30-somethings, you know, the younger audiences are somewhere else. I heard this and I had the opportunity to sit down and talk with a group of high school students by collaborating with the outreach team. They got me a classroom with high school students and I just asked them, round about how many of you guys have Facebook? Pretty much everybody had an account, but they really weren’t looking at them every day. I thought, this is interesting, which kind of sparked my interest of doing a survey and kind of putting it out there, as am I wasting my time marketing solely on Facebook and Twitter or do I really need to reach out to these other ones and really take them into consideration? That’s really what sparked it. About that same time, NCMPR was putting out a request and I thought, this is really interesting, so I thought I’d put something together and kind of present on it. As the data kind of came through and I kind of did some more analytics and you know, really studying into what’s what and where are students are, I really noticed that Facebook is still a viable resource and it’s really there. It’s a marketer’s dream. You can target specific people. You can really see down to your comments and everything, how many people are interacting and what’s working, what’s not? It’s awesome. I looked at my analytics and Facebook and a lot more of my 30-something plus were really interacting on it. We have in our new student orientation, all of our students that come through, they’re invited and everything to like the Facebook page and like all our social media and so we’ve got our fan base is pretty accurate, but as far as the engagement, it’s just not there in the younger group. It’s not as dominant, so I thought that was pretty interesting. When I did the survey, to answer your question, Facebook hasn’t really lost its iron grip, there’s still a lot of students that engage on it. It’s the dominant one. It still is the dominant one, but you know, Snapchat and Instagram have risen like nobody’s business, they’re really outdoing, even Twitter. Got you. Facebook might have the larger audience, but in terms of engagement, is that basically what you’re saying? In terms of engagement, Snapchat and Instagram are just by far reaching that group a lot more? Yeah, I look at the statistics. We put out a survey and I looked at the statistics of those that are engaging and they’re about the same as Instagram and Snapchat and so after I did some research, Facebook is still dominant, but I’m seeing a lot more of our students are on these others as well, so not to disregard them and we really should be there. Got you. You guys are looking at, not only your college students, but you’re looking at high school students, as well? Right. Whenever I did a focus group, some of the college students that I had asked their opinion, they said the high school might be a little different because they’ve got their peers, they’ve got their parents that are on Facebook that they might not want to interact with and so the peer pressure in that, it might change what they’re using, so that’s why I really wanted to focus, have a focus group with the high school students. When we did our survey, I went to high school football games and I asked a few high school classrooms to also participate so we could get a good mix. Those are kind of our target audience too, those that are incoming. Right. I kind of wonder if they’re going to make this transition. If you’re in high school and you’re mostly using Snapchat because you don’t want to be on there with your parents and everything, but obviously stuff on Snapchat just disappears and if you want to really stay connected with your friends and kind of have this history there with it, it seems like you would want to be, when you get a little bit older, when you get to that college level, that you might be more likely to transition to a Facebook or an Instagram. Are you seeing that at all? I did see some of that, but I had misconception about what Snapchat was. Quite honestly, I really thought it was like a sexting thing because obviously, a lot of people have that stipulation because it’s like a ten second disappearing picture, okay, we’re talking about younger kids, but whenever I got in the classroom with them and I talked to them. Then I also really threw myself in there being 30-something and tried to really engage on it. They all say, those that were participating in it, it’s just a fun way to show pictures and video. Really, it’s just at the moment, they’re sharing moments now, happening now, and I think it’s just the millennial sort of mindset and it really attracts them. I came in with the stipulation that, I don’t know why as a college person, how I could enter that environment, but it really isn’t that way at all. Doing the research and kind of looking at it kind of broke off some of the things that I was thinking that it was going to be. In our sessions when we were talking about, there are ways for you to do a Geo fence around your campus. It’s kind of, Snapchat it’s kind of like just putting a different [inaudible 00:13:21]. You can still use it. It might just appear, but there’s still ways for you to engage your students with it and, just different rules and things. They have a geo fencing thing that you can, a small fee that you can pay for that will mark off your campus, and so anybody entering it can get a Snapchat that tells them about events on that day or something like that. Yeah, so there’s kind of cool things about that that I hadn’t realized until I really did some research into it. You guys also found some really interesting stuff about the wealth of, if they come from a wealthier family or lower income teens, are using different social media channels. What was interesting is, the Lone Star College Montgomery campus is located up in the Woodlands area, which is in a wealthier community. I think our 20 percent of our population here make over [inaudible 00:14:20] ten thousand dollars a year. Whenever I have these high school students come on campus and I was doing a focus group with them, a lot of them were using Snapchat and not a lot of them were using Facebook. Then when I did some research on the Pew Research Center, they had done a study that had shown, and I’m not sure exactly the correlation of why that is the way that it is, but it seems to match what I was finding with the students that I had is that more wealthier families, the teens were using Snapchat and on the opposite spectrum, more of the lower-income families were using Facebook. I don’t know what that’s about, but that’s what we were finding. Then I was like, okay, that’s what’s going on with my demographic that we have in this community. Where is Twitter falling in on that? Twitter is an unusual thing and I know you had, we did some studies and we see that Twitter, there’s about 30, 40 percent of our students are using Twitter, but really Twitter is for a communication with our community. We’ve really seen this, I haven’t really done specific numbers on this, but I can see it when we’re engaging on Twitter, that a lot of our community members and things are sharing events, sharing theater events or events that we hold on campus or information about our alumni or things like that. It’s really an important aspect of the college, we haven’t given that up, but it’s really not what, there are a smaller percentage of students on Twitter that are using it quite often and especially the younger age high school students, they are using it as well, so it’s viable. The thing that I’ve seen in what we’re doing is just that it’s real community-based, so you kind of have to change your audience for that. Got you. You pretty much have to have a hashtag, right? Anything that’s centered around a common bond, a common event, or common interest, really. Yeah. Hashtags are really important to keep your community in kind of, get that out there. I was going to say, what I’d always thought is that we had to generate our own information on Twitter. What’s nice or what you should be doing is finding those threads of information that really pertain to your students. For example, I have a scholarship thread that I follow and anytime something pertains to students, our demographic, like some of the scholarships are for North Carolina or somewhere that doesn’t relate to our students and I wouldn’t re-post those, but things that are related to our students, I’ll try to re-post. I did have a student tell me one time that they applied for one of those that they found on Twitter and that they got accepted. Which is a cool success story. The things that you can do to kind of, you want to create a thread of information that pertain to your students so that when they pick it up, they can really use it. Twitter always amazes me, the many uses that you have for it. I know one thing that we’ve found as a business is media is all about Twitter and most of the stories that we will pitch to news media now, we will pitch it via Twitter instead of sending emails and we have really good success doing that. That’s really cool. It’s almost like a micro-blog site and that’s kind of what it had started out with, right? If you were interested in science or something, you could see everything that was going on because people would post them out. Then the younger audience kind of took it and were like, I’m going to start posting on my own instead of just following people. It kind of evolves and changes. Right. How do you get more faculty and staff and administrators involved on Twitter? What’s interesting is I have found that they kind of appear on their own. They tell me that they’re interested in this. You have to find somebody savvy enough and interested enough to do it already, but if you can influence them or say, hey, let’s collaborate a little bit together, you can get that engagement there. What I did or what I’ve done is notice those that are posting on the hashtag. Of course I know the professors and things like that, so I just kind of follow them and share and kind of engage in it on that way. It kind of encourages them to keep going and then anybody that’s kind of interested in it, you just kind of put the buzz out there. Okay. Kind of related to that as well is, there’s some community colleges don’t have a Twitter account at all, which is surprising to me. Some will have their one account and there’s some out there, they must have at least 20 accounts. I don’t understand how they manage that, but what is your Twitter account situation like at Lone Star? We have a system of colleges and each of us has our own Twitter account and we also have a system-wide one. Our system-wide one pretty much puts out all main information but we still have our local little cosmic areas where we have things that are related to our local communities, so even though we’re all in north Houston, it’s a really big area. We all have little things that we’re doing, like whether it’s events going on and things like that, so what we try to share between us, like things, if there’s something out there that’s an announcement for system-wide, we try to engage on that by sharing. We don’t duplicate our efforts, but there’s definitely information in our little microcosms that pertain to our specific students. Okay. I’m not afraid to admit, I kind of struggle with Instagram a little bit. Why is it important to include Instagram in your social strategy? Instagram is real visual and a lot of our students are really visual learners. You’re appealing to, I saw some data that was like, women are really interested in more visuals. You’re going to see a dominant role there in all visual social media, Pinterest, Instagram. That’s not saying that guys aren’t on there, they are, but just a little data on that. I think with the whole Instagram thing it’s about taking really nice pictures or showing with a group of pictures who you are and where you’ve been and what you’re doing so I think it’s just a really good appeal. If you’re going to go to the campus here, you can quickly visually see things that are appealing about your campus. You can show pictures. We had like this endangered species class. They brought a bunch of animals in, so we went over there and took some Instagram pictures and posted them up. Then we showed campus life and whatnot, so if anybody’s interested in going to school here, they can quickly see how rich it is. It’s not just a community college. You’re getting like a really rich education with all the things that are going on here. All our advances in biotechnology and whatnot. We have that way to visually see it on a board and showcase what we have here. I wouldn’t discount it plus a lot of people, our students and stuff that are looking at Instagram. Got you. Instagram is for video as well as images? Yeah, you’ve got video as well as images. It’s a smaller video, but you have that opportunity, yeah. It’s kind of fun because, the limitations you have obviously is you have to use the app so you have to use a phone or whatever so we’re constantly taking the iPad or a phone out there to take pictures, but you can do slow motion, you can do more creative things with your video. That sort of fans out and makes you look more interesting and things like that. We did this girl that was hula-hooping with like a health event that we do that’s week-long, so we were going out there taking video of people hula-hooping or playing volleyball or doing all this other stuff and we kind of tried to make it a little more interesting with the fun phone features or something. It’s a fun, engaging way. People will see that it’s more like awareness or brand awareness. What are some of the things that you post that perform the best, that get the most engagement on Instagram? Usually, it’s student pictures. Students like to see other students, they like to see what’s going on around campus and themselves, so we try to do like successful stories or things like that. They like to see themselves, honestly. That’s what we’ve seen a lot of success with is students that can recognize themselves with their friends and then they like it and share it. One other thing that I didn’t mention about Instagram is that we have our digital signage that have that are like TVs around campus, I don’t know, I’m sure if we have them now, but we use Industry Weapon and they have an app or a little, yeah, an app that use that’s an Instagram thing where we can post on our screens by selecting what, but we set an hashtag, we select what pictures we want out of that and they can re-post around campus, so people that are looking at the TV screens can see themselves and their friends. That’s been really successful. That’s really neat. What’s the name of that app? We use Industry Weapon, which is a purchased thing for our digital signage. Through there, we’ve been able to use their Instagram application. There’s a huge percentage of people using apps like Snapchat. What are some of the other applications that are similar to Snapchat that, I guess they have the deleting messages, right? There’s so many messaging services. One thing I wanted to share with you is Pew Research Center did a survey and it was about mobile messaging and that data, if I were you, go look at that, that’s a great resource. I found three different surveys that they did that really helped out. There are so many social marketing out there, it’s ridiculous. I think that Snapchat is one of the most used, which is why we focus on it. We can really spread ourselves thin if we try to go in and so many things. Another thing too is that Vine was like so popular about a year or two ago and I talked to the students now and it just kind of phased out. They’re not really using it very much. You see the Vine videos on Youtube now. Right. I think that social media changes but it just kind of goes there. Youtube is really strong and people are there. Kind of relating to that, I felt like Periscope, I guess about four or five months ago, it really started coming on strong with the live video feeds and I guess there’s also Meerkat is another thing, but Periscope being on my Twitter. I really felt like it was really primed to take, and I think it still could, but are you guys doing anything with Periscope yet? I’ve done some things personally to try to see where we can put it in and plug it in, but we haven’t done anything personally with it on campus but that would be a great place to do, I mean, for a campus, it’s great. Anytime you have an event or a really neat exciting thing, people can actually look at it everywhere. So it’s perfect for a campus environment. We definitely want to try it out but we haven’t done anything right now. I think also related to that is Youtube. You could do livestreaming via Youtube as well. I think you have to have at least 100 subscribers to do it. I really think you’re going to see a lot more of that in the future. There’s a local high school here, our county school system, they’re shooting football games, basketball games, baseball games, using a multi-camera setup that all feeds into a computer. Yeah, they’re using a computer software that does the live switching and it has the graphics, it has the scoreboard, the score of the game, the timer and everything. It live streams to Youtube, which is great, that means you can watch it live, but then once the live event is over, then it exists in Youtube as a video that you could go reference later on. That’s really nice. I would definitely video some of that or look into that. Community colleges being able to broadcast their arts events and sports teams, athletic teams. I see so much potential there for sure. Even in the classroom, I’ve talked to some faculty that were really interested in putting a blog together and there’s other ways to do that as well, but that’s a great idea. The lectures and the things that are going on in the classroom, to see a little bit of what that discussion looks like and to see that engagement. It’s really nice to be able to see what’s going on in the classroom and what we’re doing, so not only with our events and things on campus, but also that exciting and engaging conversation. Absolutely and kind of related to that as well is Facebook also has come out with their live video streaming, as well. I think you have to be a public figure or something. I don’t know how they determine that, I guess you apply to that somehow and they’ll probably take the reins off that a little bit as they go along, but I could see, there’s just so much potential there with live video in the classroom like you’re saying. Yeah. It’s always changing, right? You always have to keep your tabs on what’s going on. I find that there’s a lot of information on Twitter, to find those threads and that information, just to find the resources to know where to look and what to do as it changes. Is there anything else that you guys are looking at for down the road? I know there’s only so much that you can do. I know Snapchat is, we had a lot of discussion in that. I kind of let the room kind of take where they wanted to go with that. A lot of discussion was about Snapchat and the limitations on that. One thing I did notice is that, I read something today that they’re trying to make moves in making it more, like the analytics, more marketable, or more information on the analytics side, so who knows how things are going to change and whether, how they’re going to change and whatnot. The most important takeaway is just that we need to not be afraid to embrace these new things and kind of look at where students are and try to embrace it. Yeah, it might go away, but I think it helps to know that our students are there and they’re really excited about that, these different social media platforms, so if we can engage on them, we just look a whole lot better in their eyes, as far as like trendy and fun and a good place to be at, you know? A good college to go to. Absolutely. There’s so many things for us to think about these days but there’s so many ways that we can reach out and engage with students. Thank you so much for coming on the show today and sharing your knowledge on this topic. We really appreciate it.